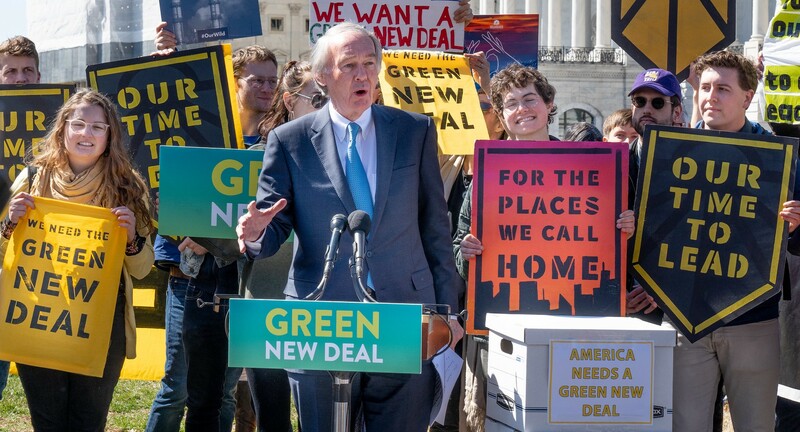 The Green New Deal and the embrace of similarly audacious left-wing ideas put at risk the party’s opportunity to defeat Donald Trump. Why are Democratic presidential candidates so willing to advocate for audacious left-wing policy proposals such as the Green New Deal and reparations to compensate Blacks for slavery, proposals which are backed by progressive activists, donors, and primary voters but are likely to be a very tough sell for the general electorate? In that article, I argued that the Green New Deal has already done damage to the Democratic Party’s chances heading into the 2020 elections, while hurting efforts to build momentum on behalf of climate and energy policy options capable of passing during an era of enduring divided government. The goal of Green New Dealers is not to broker cross-alliances between the center-right, center-left, and left wing, drawing on the best ideas that those factions can offer, but rather to build progressive power, I wrote. Yet what might be good for progressives in wresting control of the Democratic party from moderates is not likely to help combat climate change or be good for the country. People who are made conscious of their group membership are driven to participate on behalf of their groups, not the greater good, research shows. In Edsall’s column, Julie Wronski, a political scientist at the University of Mississippi notes that because of the diverse coalition of groups that make up the Democratic party, candidates in order to win the nomination need to “start embracing boutique policies for these groups,” even at the risk of losing general election voters. On the issue of reparations, for example, Edsall cites recent polling that indicates sharp divisions among voters. Whites were opposed 81–15. Latinos were split, with 46 percent in support and 47 percent opposed. African-American voters support reparations, 58–35. In other polling, among all voters, opposition to reparations was nearly twice as large as support, 47.1 to 26.4 percent. But because of the outsized role that African-American activists and voters play in many state primaries, Edsall writes, it is in the short term interest of candidates for the Democratic nomination to voice support for reparations, even it risks their general electoral chances. In another point of evidence, Edsall cites new research by Yphtach Lelkes, a political scientist at the University of Pennsylvania, who in a forthcoming paper uses a series of experimental designs to show that voters in primary elections strongly prefer more extreme candidates, seeking to drive from the party moderate candidates and their issue stances. If we are to decrease polarization in the U.S., “we need politicians that are politically moderate. Unfortunately, voters prefer politicians of their own party that are politically extreme. This incentivizes extreme political candidates, which will only exacerbate current tensions,” he told Edsall. Opinion | How Radical Is Too Radical for 2020 Democrats? Trump won in 2016 by moving sharply to the Right, while Clinton was seen as remaining more incremental than aggressive in her policy proposals. If she had moved more to the Left, perhaps she would have won? So why not emulate Republicans and Trump in the 2020 elections? But Carmines notes that this logic and strategy remains risky: “Both of these premises are mistaken and could very well lead Democrats to electoral defeat when victory is within sight,” he told Edsall. In a 2012 essay co-authored with Dietram Scheufele titled “The Polarization Paradox: Why Hyper-partisanship Strengthens Conservatism and Undermines Liberalism,” we warned about the emerging shift among Democrats towards a posture of “fighting fire with fire” in which they believed they had no choice but to try to beat their conservative opponents at their own game. Even back then, however, there was strong evidence that such a strategy was dangerously misguided. Extreme polarization has served the American right-wing very well, driving moderate leaders from politics, promoting feelings of cynicism, inefficacy, and distrust among the public, and forcing Democrats to spend huge sums of money on canvassing, texting, social media, and celebrity appeals to turn out voters in general elections. Less clear is how America’s escalating ideological arms race will conceivably serve Democrats. Instead of going to war against the Right, Democrats would better serve their social and political objectives by waging a war on polarization, we argued. Reforming our civic, political, and academic institutions in ways that create some possibility for moderation, deliberation, and crosscutting discourse, we noted, should be a high priority for Democrats, who must recognize that without a functioning civic culture, there can be no progressive governance. Yet over the past seven years, Democrats and progressives have responded to the provocations of Trump and his allies on the Right with ever deepening rigidity, vitriol, outrage, and a growing unwillingness to compromise, even with moderates. In doing so, however, progressives have only strengthened the hand of their opponents, contributing to the gridlock of our political institutions, providing Trump and his allies with an easy justification for obstruction, and ultimately made the unthinkable — the dismantling of the postwar welfare state — thinkable. Trump & Co, in this sense, are playing a long game, happy to starve the beast and delighted by dysfunction, even when they control the government. For this reason, as Democrats and progressives unwittingly conspire to turn American politics into a zero-sum game, Trump and his coalition win even when they lose.